CBeebies’ favourite double act is coming to town! The Chris & Pui stage show is based on their TV work, especially ‘Show Me Show Me’. It features the toys & characters from the hit TV programme as well as their popular songs and routines. Catch the ‘Gingerbread Man’, marvel at the ‘Ugly Duckling’ becoming a beautiful swan and "oooh" and "aaah" as Miss Mouse attempts to zoom zoom zoom to the cheesy moon in her rocket. See Incy Wincy, Twinkle, Old MacDonald, Humpty, Granny Humpty and many more live on stage along with Tom, Momo, Teddington, Stuffy and Miss Mouse. With songs, comedy sketches, a dash of magic and heaps of joining in, this is a family show for children aged two to a hundred and two. 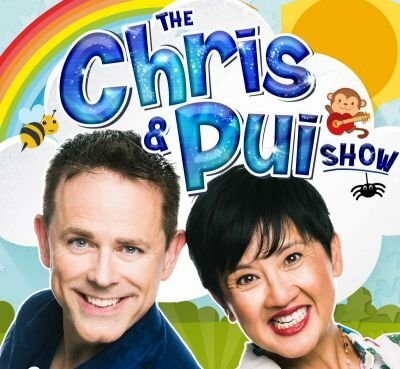 Get a groovy move on and see the freshest family show in town, 'The Chris & Pui Show'!